Choices are everywhere when it comes to buying a home in Murrells Inlet and in todays real estate market home buyers need to understand what those choices mean before they make an offer on a property. Get ready to show some love to the men and women of the military this 4th of July in the Salute from Shore fly over along the Grand Strand and coastal South Carolina for the second year. This monday’s fly over will be along the Myrtle Beach area around 1 p.m. as people line up to Salute our Military. This year there will be F16’s and it will only take 20 minutes to fly the coast. Wear your red, white and blue and show your support. Murrells Inlet has become a must do day trip for vacationers that visit Myrtle Beach and the Grand Strand every year and a top destination for locals too. 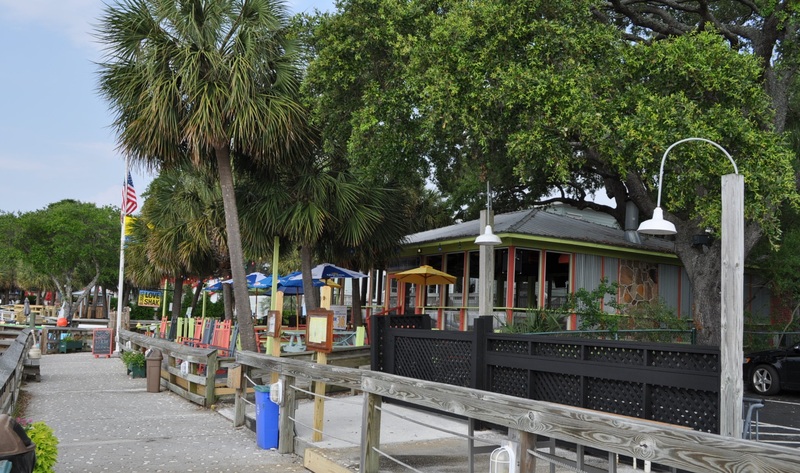 From the famous ‘Seafood Capital’ with a handful of restaurants Murrells Inlet has become a top pick for nighly dining and entertainment or just a stroll down the Marshwalk. If you look at any popular location you will find common attributes and most of the time higher pricing but it is possible to live in Murrells Inlet without breaking your home buying budget. Savvy real estate investors are looking at Murrells Inlet homes along with second home buyers because of the wonderful free amenities that exist in the area. You can launch your boat in the inlet or the river with boat access within just over a mile or for golf lovers Murrells Inlet will not disappoint. Add the bike path, Marshwalk and Waccamaw Community Hospital along with plenty of dining and shopping and you have a winning combination for location. Sleepy no more this fishing village has arrived and is a welcome place to call home. Even in these tough times homes that are priced correctly continue to sell and it is doubtful prices will go much lower in the sought after community. This is especially true in Murrells Inlet with the great amenities and affordable prices we now have in the area. Just today I spotted a brick home within walking distance to the creek listed at $120k. Yes it needs work but the point is the price is fantastic and it may very well be under contract by tomorrow. Living in Murrells Inlet without breaking your budget is possible and if you are interested in Murrells Inlet homes contact me for help in finding your Murrells Inlet home. Copyright©2011 Sandra Bundy, Broker-in-Charge, B&P, Inc. Serving the Pee Dee and Grand Strand of South Carolina. When it comes to celebrating our independence Murrells Inlet certainly knows how to roll out the welcome mat and is home to some of the best July 4th celebrations on the Grand Strand. Much more than just the Seafood Capital of South Carolina the Murrells Inlet community is home to 2 great events on the 4th of July and the Murrells Inlet Boat Parade and Fireworks celebration are always crowd pleasers. What started as a few friends celebrating the 4th on the creek has turned into one of the most popular and well attended parades on the water in Murrells Inlet. I was on a sailboat that year and it was great fun but certainly a much smaller event than it is today. There was no Marshwalk for spectators and Garden City participation was much more limited. July 4th 2011 marks the 28th annual Murrells Inlet Boat Parade and boats will line up for the parade leaving the Garden City point at 10:00 a.m. Over the years the Murrells Inlet Boat Parade themes have proved to be quite an inspiration for the entrants and this year’s “Ride the Inlet Wave of Freedom’ is sure to inspire many more as both boats and boat docks from Garden City to Murrells Inlet are decorated to compete for the Murrells Inlet top prize and bragging rights as the best! The popularity of the Murrells Inlet Boat Parade has grown every year and while viewing is possible from at private homes in Garden City and peeks from Marlin Quay Marina the best place to view the parade is along the Murrells Inlet Marshwalk. Want to hang out all day and have a seat for the festivities check in at Bubba’s Love Shack or Capt. Dave’s Dockside and ask about the $50 rocking chair rental with all proceeds going to Murrells Inlet 2020. The Marshwalk is also one of the best public viewing locations for the Murrells Inlet Fireworks extravaganza that will start at 10 p.m. This years fireworks are set to be bigger and better than ever and when it comes to celebrating the 4th of July Murrells Inlet, South Carolina is definately the place to be. When it comes to seafood done right and southern hospitality from gracious hosts you will not find a better place on the Grand Strand then Russell’s Seafood Grill and Raw Bar in Murrells Inlet. Located near Morse Park with great creek views on the outdoor deck or inside the cozy dining room Russell’s can’t be beat for an excellent meal and great service. In the early 90’s in what was left of Nance’s Bar after Hugo destroyed the creekfront restaurant Russell Vereen set about doing what he has always done when he established Russell’s Seafood Grill and Raw Bar. The Vereen family has a long history of serving up great seafood and once inside you are bound to get a glimpse of that history from the many relics decorating the interior. Be sure to pay attention to daily specials as the Hog Snapper is delicious and not to be missed if it is on the menu. From the moment you enter the door until you say your good byes Russell & Karen Vereen and the staff at Russell’s Seafood Grill and Raw Bar are sure to make you feel welcome. Copyright©2011 Sandra Bundy, Broker-in-Charge, B&P, Inc. Serving the Pee Dee and Grand Strand of South Carolina. As I was checking the status of Murrells Inlet home sales for June to see how this month might play out I ran across a whopping 52% list to sale value for a couple of Garden City Beach homes and discovered the saga of the overpriced listing. It is no wonder that both the recent sales were on the market an average of 643 days I mean when a listing is overpriced you should expect higher marketing times. One thing for sure about Murrells Inlet home prices is that overpriced listings linger on the market longer than most. These days homes are selling at a much slower pace than the good old days only a few short years ago. Back then a seller could throw out a price and the appreciating market was sure to catch up. Not anymore and likely not ever again as we have learned the true value in a home is more deeply tied to what is happening to our neighbors and if they are going to foreclosure then there goes our homes value. You would expect both of the Murrells Inlet properties to chase a falling market and both certainly did selling at just over half the original list price. One sale was under contract 63 days after the final price reduction and the second home went under contract the same day it was reduced a sure sign that overpriced listings are rejected by buyers in todays market. While sellers have an idea of what they would like to sell their home for a good agent will help sellers to understand that the market sets the price. In the case of overpricing listings sellers can expect that their property will be spending more time on the market and will not sell until it is priced correctly. It is our goal to help avoid overpriced listings even if that means not getting the business. For me the saga of the overpriced listing is one I would rather not have as in this or any market proper pricing is key to selling Murrells Inlet homes. Copyright©2011 Sandra Bundy, Broker-in-Charge, B&P, Inc. Serving the Pee Dee and Grand Strand of South Carolina. The Murrells Inlet History Project and Murrells Inlet Fishing are very popular facebook pages that prove that fishing in Murrells Inlet is enjoyed by the masses today, much as has been the joy of many locals and tourist alike in years past. While today many people have access to fish the Atlantic in personal watercraft back in the day Murrells Inlet was home to no less than 3 Marinas each with head boats to take fishermen out for half and full day trips and was a big part of the Murrells Inlet experience much like the seafood resturants are today. I remember how busy it used to be around Captain Alex Marina before the 7 am departure of the Capt. Alex and the air of anticipation as the passengers arrived to get on board to head out to the Gulf Stream for a full day of fishing. 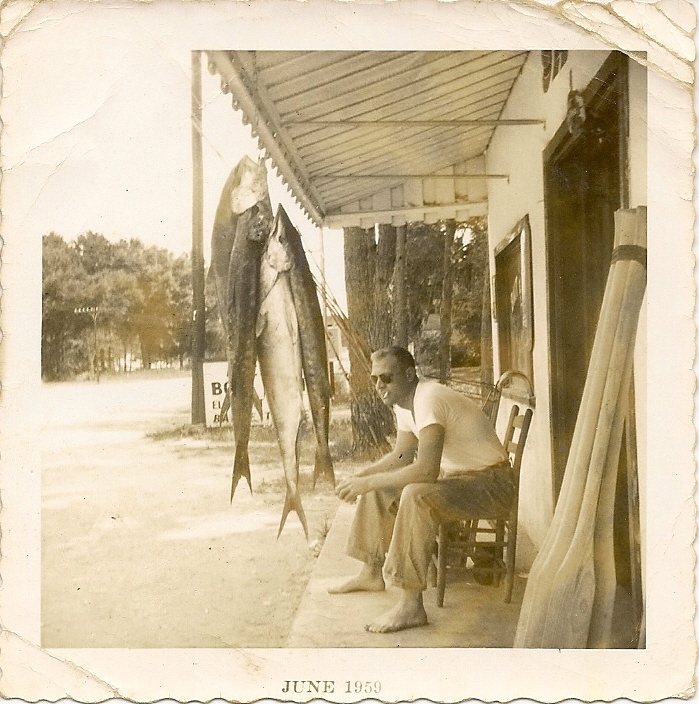 Back then fishing in Murrells Inlet was much more of an adventure and my daddy certainly took a huge leap when he and my mother brought the first Gulf Stream Head Boat to Murrells Inlet and made fishing more accessible to all. I didn’t know enough at the time to appreciate the pioneering spirit my parents along with the other great boat captains and crews had as they made the daily trips out of Murrells Inlet to go catch the big fish. Yes the fastest boat that would take passengers to the Gulf Stream in two and a half hours proved to be quite popular and the 6 pm return became an event that was much more important when nobody watched TV and the Sun News reported on the large catches on a regular basis. The lines would be stretching out the door at the Bay Harbor Resturant and one of the local kids would be outside ringing the old bell behind the rose garden alerting everyone that the Capt. Alex was backing into the dock with a load snapper and grouper from the day at sea. The Capt. Bill, New Inlet Princess and Miss South Carolina were other popular headboats that docked in Murrells Inlet along with the Flying Fisher, Sun Gypsy, Thunderbird to name a few and all were head boats that dock along the Murrells Inlet waterfront where the popular Murrells Inlet Marshwalk is located today. The history of Murrells Inlet fishing is likely to change depending on the teller but one thing is for sure fishing in Murrells Inlet is as popular today as is was in the early days but today it is a whole lot easier to get out in the Inlet and go fish. Copyright©2011 Sandra Bundy, Broker-in-Charge, B&P, Inc. Serving the Pee Dee and Grand Strand of South Carolina. If you have ever strolled down the Murrells Inlet Marshwalk you could not miss ‘Bubba Love’ sitting on a bench with a seat just for you. 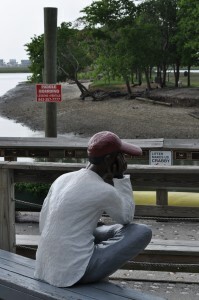 24/7 the wooded statue looks over the entry to the creek front walkway and welcomes you to take a load off and soak in goat island and great views beyond. The statue carved out by local artist Lee Arthur perfectly captures the essence of ‘Bubba Love’ and restaurateur Dave Owens carved out a niche with Bubbas Love Shack on the Marshwalk in Murrells Inlet. From the moment you enter Bubbas Love Shack you can follow the story of ‘Bubba Love’ from goat tender to oyster catcher and everything in between spread out in the many photographs that cover the walls. Nothing fancy here at ‘Bubbas’ everyone feels right at home in the laid back atmosphere and first welcome from another wooden statue of this Murrells Inlet Icon. If you are looking for fresh local seafood with no frills and fast friendly service with a lot of love ‘Bubbas Love Shack’ is the place. 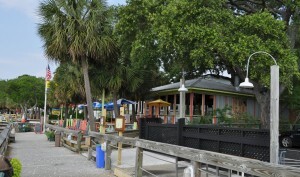 Serving lunch and dinner daily on the Marshwalk in Murrells Inlet. Best kept secrets: Friday lunch special of fried flounder with slaw and fries is a great bargin. Take a break in the brightly colored rocking chairs outside on the creek and soak it in!